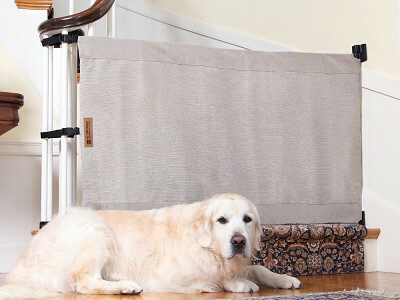 Most stair gates are eyesores, but The Stair Barrier does the job while complementing your home décor. It looks appointed while securing the bottom of the stairs from kids or pets. There’s even a version that works outdoors. Founder Janelle Fitzpatrick was all too familiar with tacky plastic and metal safety gates. When she moved into a new home, she invented this effective, attractive alternative. Each lightweight gate is Made in America with Repreve canvas that’s constructed from recycled water bottles, with boning to give it extra structure. The Stair Barrier attaches to bannisters without damaging them, so you will need at least one at the bottom of your stairs. (For single bannister setups, there’s a wall installation kit.) To choose the right size, make sure you measure carefully to get a snug, secure fit. To access your stairs with the gate in place, simply unclip the straps and roll it off to one side. To put it back, unroll and re-secure the straps. Hi Grommet Community! I am so excited to share my invention, The Stair Barrier. It has been a long road from conception almost 9 years ago to today, making the journey and each moment like this that much more special. I am extremely honored to be here and featured by a company committed to my shared values. I look forward to answering any questions you may have and feel free to send me photos of hard to gate stairs! What a super cool, stylish solution to keeping our little guy off the stairs! Well done Janelle... Congratulations! @Michelle For the wall-to-banister it requires minimal drilling. It attaches with two black brackets, a carbon steel rod, anchors and screws. If you have molding at the bottom, there are also spacers to bump out the bracket. All wall-to-banister products are sold with the installation kit included. Thanks Michelle. I think most people (before today) have just accepted they need to put up a not-so-attractive gate to child- and pet-proof their stairs. Why did you refuse to accept that reality and create The Stair Barrier? And a follow-up question, how did you turn that from a good idea you had into a fully formed business? @Mike Yes, you are absolutely right--most people settle and a lot of people gate off rooms or move furniture to block access to stairs. When my second child was born we had just moved into a new house that has volute/curved bannisters and were wider than normal. My old gates wouldn't work. There was not a gate or gate/install banister-adapter kit available that would work. My son is almost 9, so it took a while to get to where we are now. I had started the patent process back then, but everyone said I would have to manufacture in China and warehouse in my basement. That wasn't an option for me. About a year and a half ago I decided it was now or never. I gave up my recruiting career and dedicated all my time to sourcing materials and looking for a manufacturing partner. I found two great partners right here in Georgia. That's incredible. How difficult was it to manufacture in the U.S.? Was there ever a point where you thought the people saying that might be right? It was more difficult to source American made fabrics and I absolutely had moments where going overseas for materials from a cost perspective made sense. From a pure manufacturing standpoint it was never an option. I wanted to control the process and quality. I wanted to know the people making my product. It took a few tries, but I found a true manufacturing partner in American Bag and Linen. They believe in the product and are absolutely committed to quality. I have always been big on strong business ethics, loyalty and hard work. They have the same values. I feel very fortunate. 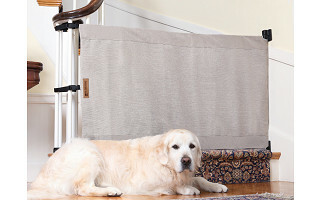 Most stair gates are eyesores, but The Stair Barrier does the job while complementing your home décor. It looks appointed while securing the bottom of the stairs from kids or pets. There’s even a version that works outdoors. Founder Janelle Fitzpatrick was all too familiar with tacky plastic and metal safety gates. When she moved into a new home, she invented this effective, attractive alternative. Each lightweight gate is Made in America with Repreve canvas that’s constructed from recycled water bottles, with boning to give it extra structure. The Stair Barrier attaches to bannisters without damaging them, so you will need at least one at the bottom of your stairs. (For single bannister setups, there’s a wall installation kit.) To choose the right size, make sure you measure carefully to get a snug, secure fit.